For the pre-1968 university, see Catholic University of Leuven (1834–1968). For the present-day French-speaking university, see Université catholique de Louvain. The Katholieke Universiteit LeuvenA (in English: Catholic University of Leuven),B abbreviated KU Leuven, is a research university in the Dutch-speaking town of Leuven in Flanders, Belgium. It conducts teaching, research, and services in the sciences, engineering, humanities, medicine, law, and social sciences. KU Leuven consistently ranks among the top 100 universities in the world. As of 2016[update]-2017, It ranks 40th globally according to Times Higher Education, 79th according to QS World University Rankings, and 93rd according to the Academic Ranking of World Universities. According to Thomson Reuters, in 2016, 2017 and 2018, KU Leuven researchers have filed more patents than any other university in Europe; its patents are also the most cited by external academics. As such, KU Leuven was ranked first in the publication's annual list of Europe's most innovative universities for those three years. A number of its programs rank within the top 100 in the world according to QS World University Rankings by Subject. It is the highest-ranked university from the Low Countries. The old University of Leuven was founded at the center of the historic town of Leuven in 1425, making it Belgium's first university. The University of Leuven closed during the Napoleonic period in 1797. The Catholic University of Leuven was "re-founded" in 1834, and is frequently (but controversially) identified as a continuation of the older institution.C In 1968, the Catholic University of Leuven split into the Dutch-language Katholieke Universiteit te Leuven and the French-language Université catholique de Louvain (UCLouvain), which moved to Louvain-la-Neuve in Wallonia. Historically, the Catholic University of Leuven has been a major contributor to the development of Catholic theology. It is considered the oldest existent Catholic university. Although Catholic in heritage, it operates independently from the Church. KU Leuven is open to students from different faiths. Kasteel van Arenberg, purchased by the Katholieke Universiteit Leuven's predecessor in 1921. 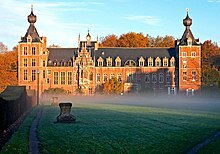 For the history of the pre-1970 university see Catholic University of Leuven (1834–1968). In 1968, tensions between the Dutch-speaking and French-speaking communities led to the splitting of the bilingual Catholic University of Leuven into two "sister" universities, with the Dutch-language university becoming a fully functioning independent institution in Leuven in 1970, and the Université catholique de Louvain departing to a newly built greenfield campus site in the French-speaking part of Belgium. Pieter De Somer became the first rector of the KUL. In 1972, the KUL set up a separate entity Leuven Research & Development (LRD) to support industrial and commercial applications of university research. It has led to numerous spin-offs, such as the technology company Metris, and manages tens of millions of euros in investments and venture capital. The university's electronic learning environment, TOLEDO, which started in September 2001, was gradually developed into the central electronic learning environment at the KUL. The word is an acronym for TOetsen en LEren Doeltreffend Ondersteunen (English: "effectively supporting testing and learning"). It is the collective name for a number of commercial software programs and tools, such as Blackboard. The project offers the Question Mark Perception assignment software to all institution members and has implemented the Ariadne KPS to reuse digital learning objects inside the Blackboard environment. On 11 July 2002, the KU Leuven became the dominant institution in the "KU Leuven Association" (see below). KU Leuven is a member of the Coimbra Group (a network of leading European universities) as well as of the LERU Group (League of European Research Universities). Since November 2014, KU Leuven's Faculty of Economics and Business is accredited by European Quality Improvement System, which is a leading accreditation system specializing in higher education institutions of management and business administration. Since August 2017, the university has been led by Luc Sels who replaced former rector Rik Torfs. The Belgian archbishop, André-Joseph Léonard is the current Grand Chancellor and a member of the university board. KU Leuven is dedicated to Mary, the mother of Jesus, under her traditional attribute as "Seat of Wisdom", and organizes an annual celebration on 2 February in her honour. On that day, the university also awards its honorary doctorates. The seal used by the university shows the medieval statue Our Lady of Leuven in a vesica piscis shape. In the academic year of 2012-2013, the university held Erasmus contracts with 434 European establishments. It also had 22 central bilateral agreements in 8 countries: the United States, China, South Africa, Japan, the Democratic Republic of Congo, Vietnam, Poland, and the Netherlands. The vast majority of international EU students came from the Netherlands, while most non-EU ones come from China. KU Leuven hosts the world's largest banana genebank, the Bioversity International Musa Germplasm Transit Centre, that celebrated its 30th anniversary in 2017 and was visited by Deputy Prime Minister and Minister for Development Cooperation, Alexander De Croo. Academics at KU Leuven is organized into three groups, each with its own faculties, departments, and schools offering programs up to doctoral level. While most courses are taught in Dutch, many are offered in English, particularly the graduate programs. Universitair ziekenhuis Leuven (UZ Leuven) is the teaching hospital associated with the KU Leuven. Its most well known and largest campus is Gasthuisberg, which also houses the faculty of pharmaceutical sciences and most of the faculty of medicine. Notable divisions of the university include the Higher Institute of Philosophy and the Rega Institute for Medical Research. The university is a member of the Flanders Interuniversity Institute of Biotechnology. The Interuniversity Microelectronics Centre is a spin-off company of the university. The students of the university are gathered together in the student's council Studentenraad KU Leuven. They have representatives in most meetings at the university, including the Board of Directors. It was separated from LOKO [nl] in 2012-2013 when the different locations outside of Leuven became part of the university. LOKO remained the overarching student organisation for all students in the city of Leuven. KU Leuven joined the Venice International University on October 29, 2016. According to QS World University Rankings by Subject in 2019, KU Leuven ranked within the world's top 50 universities in the following fields: Philosophy (31), Theology (14), Pharmacy & Pharmacology (35), Psychology (24), Geography (34), Development Studies (43), Law (37), and Dentistry (17). Also according to QS, many other KU Leuven programs rank within the top 100. Jan Callewaert, economics, founder of Option N.V.
Joan Daemen (b. 1965), cryptographer, one of the designers of Advanced Encryption Standard (AES). Vincent Rijmen (b. 1970), cryptographer, one of the designers of Advanced Encryption Standard (AES). Roberto Benigni (2007), Italian actor, comedian, screenwriter and director of film, theatre and television. Dirk Obbink, Lecturer in Papyrology and Greek Literature at Oxford University and the head of the Oxyrhynchus Papyri Project. C.^ The Old University of Leuven (1425–1797) is the oldest university in the low countries, and the Catholic University of Leuven (1834) is sometimes, controversially, identified as a continuation of it. In the mid-1800s, Belgium's highest court, the Court of Cassation, ruled that the 1834 "Catholic University of Leuven" was a different institution created under a different charter and thus cannot be regarded as continuing the 1425 "University of Leuven". See also: History of the Old University of Leuven. ^ "About KU Leuven". www.kuleuven.be. Retrieved 2018-04-26. ^ "Studeren aan de KU Leuven, ook buiten Leuven – KU Leuven". Kuleuven.be. Retrieved 2015-10-18. ^ "International programmes". Kuleuven.be. Retrieved 2014-03-28. ^ a b c "The Times Higher Education World University Rankings 2015-2016". ^ a b "QS World Universities Ranking 2015-2016". ^ a b "Academic Ranking of World Universities 2015". ^ Ewalt, By David. "Europe's Most Innovative Universities – 2018". U.S. Retrieved 2018-04-26. ^ "EFMD EQUIS Accreditation for KU Leuven's Faculty of Economics and Business". ^ "Belgian support for innovative agricultural research". ^ "... that our library has more than 1.3 million volumes?". Retrieved 2017-05-08. ^ "KU Leuven libraries". bib.kuleuven.be. Retrieved 2017-05-08. ^ "Studentenraad KU Leuven". Retrieved 14 July 2018. ^ "KU Leuven New Member of VIU – international". www.kuleuven.be (in Dutch). Retrieved 2017-01-20. ^ Members KU Leuven Association. Retrieved June 24, 2018. ^ Ewalt, David. "Europe's 100 Most Innovative Universities". ^ "QS World University Rankings by Subject 2019". Top Universities. Retrieved 2017-05-11. ^ "Otto von Habsburg - Akademische Auszeichnungen". www.ottovonhabsburg.org. ^ "KU Leuven and UGent to confer joint honorary doctorate on Angela Merkel". ^ Ruling of the Cour de Cassation of Belgium of 26 November 1846: "The Catholic University of Leuven can not be regarded as continuing the old University of Leuven", in, Table générale alphabétique et chronologique de la Pasicrisie Belge contenant la jurisprudence du Royaume de 1814 à 1850, Brussels, 1855, p. 585, column 1, alinea 2. See also: Bulletin Usuel des Lois et Arrêtés, 1861, p. 166.